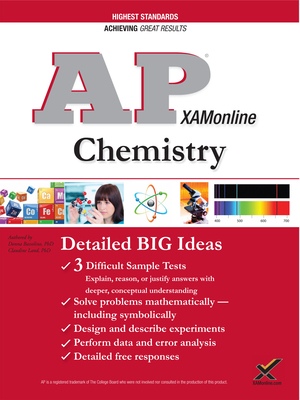 XAMonline AP Chemistry is unique because of the clarity of thought and it is written to the standards created by the College Board. It focuses on the Big Ideas, Essential Knowledge, and Enduring Understanding. Hundreds of sample test questions can be applied to the learning objective level. This study guide has it all, every content chapter is detailed to the standards, multiple sample tests, mini tests, chapter questions, free responses, multiple choice formats, etc. The care in making this the most rigorous test available on the market required the work of multiple Ph.D's . There are over 94 illustrations to give additional support in your learning. This test really exceeds most entry level college courses in Chemistry. Therefore, the state of Florida, Texas, and Illinois will offer college credits for a score of 3.